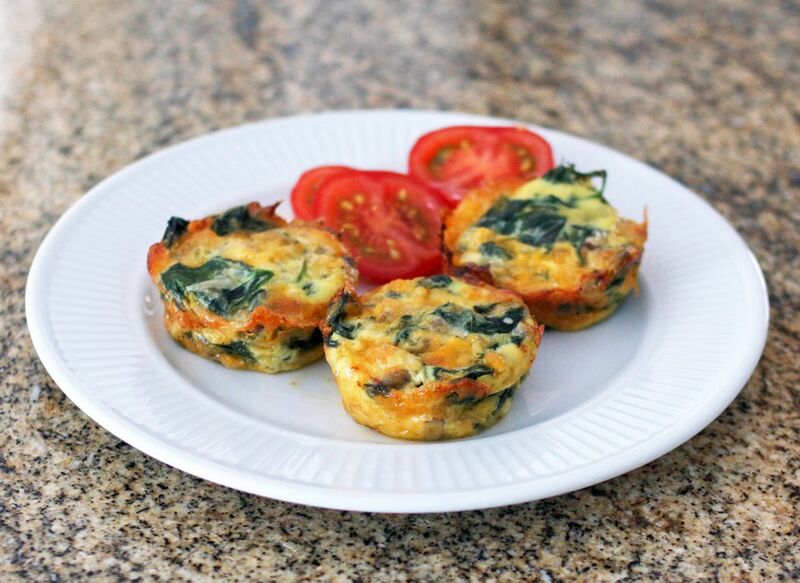 These mini crustless quiches make a delicious breakfast or lunch, and if you're on a low-carb diet, they're ideal. Serve them with fresh tomatoes or a spoonful of salsa, or serve as a party appetizer. It's a great make-ahead recipe as well. Just freeze and reheat one at a time or as many as you need. Heat the oven to 350 F. Grease a 12 cup muffin tin or spray with baking spray. In a large skillet or saute pan over medium heat, melt the butter. Add the chopped onions and mushrooms and cook, stirring, until the onions are softened and mushrooms are tender. Add the spinach, about 1/3 at a time, and cook, stirring, until the greens are all wilted. Set aside to cool slightly. In a large bowl, whisk the eggs and egg whites until blended. Stir in the shredded cheese, pepper, salt, and nutmeg. Stir in the cooled spinach mixture. Spoon the mixture into muffin cups, filling each about half full. Bake for about 25 minutes, until a knife inserted into the center comes out clean. The quiches will puff up but will deflate soon after removing them from the oven. Let them cool for a few minutes, then use a spatula to lift them out onto a tray or plate. Enjoy right away with ketchup, tomatoes, or salsa, or freeze them on a baking sheet and put in freezer bags. To reheat from frozen, bake in a preheated 400 F oven for about 10 minutes.